Irritable bowel syndrome, also known as IBS, is an extremely common disorder affecting around 25 and 55 million Americans—with the majority being women. IBS includes a combination of abdominal pain and irregular bowel habits which can constantly switch between diarrhea and constipation. Although IBS is not a life-threatening condition, it can make a person more susceptible for various diseases to occur such as colitis, Crohn’s disease, or colon cancer. IBS can be very uncomfortable, embarrassing, and can significantly alter quality of life. People who develop IBS are three times more likely to call in sick to work or school which can take a toll on a person’s well-being. Our clinic has the ability to run multiple functional medical tests which could pinpoint what is causing your IBS which include IgG food sensitivity testing, SIBO breath testing, lactose/fructose intolerance breath testing, comprehensive stool analysis, and more. After an examination and testing, we can determine what treatments are best. Celiac disease is an immune reaction to eating gluten, a protein found in wheat, barley and rye. 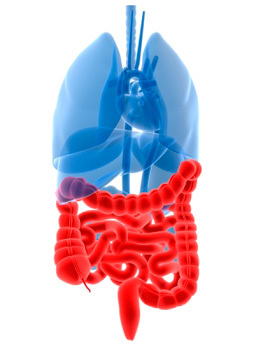 If you have celiac disease, consuming gluten causes a reaction in your immune response system in your small intestine. Eventually this reaction causes inflammation that harms the small intestine’s lining and stops the natural absorption of various nutrients (malabsorption). It is not entirely known what specifically causes celiac disease, but studies have shown that some gene changes (mutations) appear to increase the risk of developing the disease. Damage to your intestines can cause weight loss, bloating and occasional diarrhea. Other symptoms of celiac disease include anemia, loss of bone density, itchy skin rashes, headaches and fatigue, joint pain, and heartburn. Over time, your brain, nervous system, bones, liver and other important organs in your body can be deprived of vital nourishment. Unfortunately, there is no cure for celiac disease–but creating a strict gluten-free diet can help manage symptoms and promote intestinal healing. Gastroesophageal reflux disease (GERD) is a chronic digestive disease in which the stomach contents (acid, bile, etc.) leak backwards from the stomach into the esophagus. This reverse movement can irritate the esophagus, causing heartburn and other symptoms. GERD is caused by frequent acid reflex. When you swallow, the lower esophageal sphincter (circular band of muscle around the bottom half of your esophagus) relaxes which allows food and liquid to leak down into your stomach. Then it closes again. If this valve relaxes too much or weakens, stomach acid can move back up into your esophagus, causing persistent heartburn and disrupting your daily life. This continual backflow of acid can aggravate the lining of your esophagus which causes it to become inflamed. Over time, the inflammation can deteriorate the esophagus, causing damage and complications such as bleeding or breathing issues. Most people can manage the discomfort of heartburn with lifestyle changes naturopathic remedies to help reduce symptoms.